Let's get together for a fabulous tour in Portugal's University City. 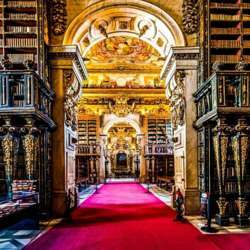 Special spots to be visited are the University's Baroque Library, one of the richest European libraries, and Portugal dos Pequenitos, a unique theme park with miniature Portuguese emblematic buildings. We will travel in a private minibus for a more relaxed trip. Confirmation with prepayment is required before March, 1. Total cost includes transportation, guided tour to University, Portugal dos Pequenitos ticket and organization fee. The maximum number of attendees Protected content - on basis first come, first served.